Home Old Age Fitness Tips How To Get Rid Of Belly Fat After 60? Reducing belly fat at any age is a hard task, but it becomes much harder after age 60. 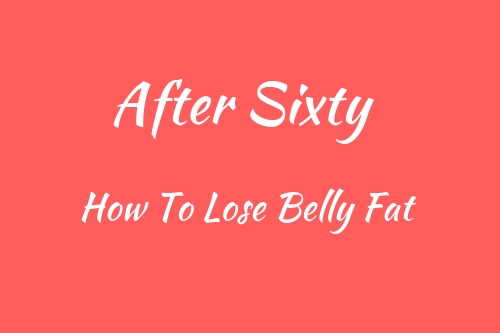 Read on here to learn the best way to get rid of belly fat after 60. As we grow old, our lifestyle becomes sedentary. Moreover, the falling levels of hormones and the increasing loss of muscle mass after age of 30 years, cause more and more fat to gather around our waist than rest of our body. For getting rid of belly fat after 60, we need to combine higher physical activities and a diet comprising of lower calories focusing on unprocessed and non-sugary foods. This is the key strategy to lose belly fat — no matter what your age is – even after 60 or 70. As we age — our weight may remains more or less same, but we can see that fat begins accumulating around waist. This happens due to the growth of visceral fat. Visceral fat is different from subcutaneous fat. While subcutaneous fat lies right beneath the skin on our hips, legs and arms, the visceral fat (also called as internal belly fat) develops deep inside surrounding our internal organs. Visceral fat is dangerous and interferes with liver function. It enhances risk of heart problems and is a key reason for development of type 2 diabetes. After age 40, the depleting levels of estrogen in women & testosterone in men causes the fat to go more toward the abdomen. That explains why as you age, the fat tends to pile up as belly fat instead of going to other body parts. To lose belly fat, the best trick is follow two-pronged strategy in tandem that is diet and exercise. In a study reported in the journal “Obesity” in 2012, it was revealed that overweight women who participated in forty five minutes of cardiovascular workout 5 times per week and who decreased their caloric intake could achieve a significant decrease in their waist size, body mass index and percentage of body fat. Though in this study only women participated, but the same strategy can be effective for men, as well. Understand Why We Gain Belly Fat With Age? As we grow old, gaining some belly fat is a natural phenomenon. Once it is gained then it becomes very difficult to lose all of it in old age, but we can certainly minimize its appearance and its negative health implications with exercises and dietary changes. After age 30, our muscles start depleting. This natural process of muscle loss is medically called as “Sarcopenia”, which every person suffers with aging. According to “The American Association of Retired Persons”’ such loss is about a pound per year after 30, if we don’t do strength training to conserve our muscle tissue. By the age 60 — with no exercise – most people lose approximately thirty pounds of muscle mass, with fat replacing most of the lost muscles. Fat is less effective in burning calories as compared to the muscles, meaning your body’s resting metabolism also takes a dip. Thus, even eating the same amount of food as you ate when you were younger, you are most likely to gain fat. So, in order to prevent accumulation of fat due to slowing metabolism rate, we need to curtail our daily caloric intake by approximately hundred calories every ten years after age 40. Thus, at 60 or after 60, you should aim to intake at least two hundred less calories every day than what were you taking in your 30s. To reduce belly fat after 60, you have to cut down your calorie intake even more. To shed a pound of fat, you should eat 3,500 calories less than what you burn. A cutback of 500 to 1,000 calories per day leads to a weight loss of one to two pounds per week. For a majority of people above 60, this caloric-shortfall will amount to be very aggressive because it will place them at a caloric intake that’s not enough to provide the required amounts of nutrients and energy. For instance, an average sedentary woman above age of 50 might be burning only 1,600 calories per day. Curtailing this intake by 500 calories would leave her with only 1,100 calories per day, which is extremely hard to sustain on long term. So, she would need to rework her weight-loss goal to lose about half pound a week, which needs a 250-calorie deficit per day. Enhancing physical activity is a great way to help you increase your daily calorie burn to enable you achieve a 500-calorie deficit. While preparing your meals, abstain from using refined grains — like white bread & pasta – and eat whole grains and fresh, green vegetables. These foods are high in fiber, which not only boost gut health, but they will also take longer to digest — so you will eat less and won’t feel starved. Include lean proteins like skinless poultry, trimmed steak, fish and eggs in every meal. Avoid sugar, fried foods, processed snacks, full-fat dairy & alcohol. Incorporate moderate amounts of monounsaturated fat & omega-3 fatty acids in your diet – but not more than 25 to 35 percent of your daily calories intake. Olive oil, fatty fish & nuts are great sources of omega-3 fatty acids. We must keep an active physical lifestyle, which is most critical step along with diet aspect as suggested above, in order to lose belly fat and maintain a healthy weight – especially as we age. We should do strength training covering all our major muscle groups at least on two days per week to help offset the natural muscle loss phenomena. You can begin strength training at any age to secure this benefit. If you are doing it first time or after a long gap, speak to your doctor before you start doing it. Once you start it then increase its intensity and weight you use, gradually. Along with strength training, we should also include cardiovascular exercise for at least 250 minutes per week. As per the American College of Sports Medicine, cardiovascular exercises help reduce belly fat and lose weight significantly. In a research review published by the scientific journal “Plos One” in 2013, it was reported that even without major dietary modification — performing moderate to high intensity aerobic training can help get rid of visceral fat in overweight women and men after 12 weeks. We are not suggesting that you can get away with not modifying your diet, but simply telling you the power of physical activity. Also never miss the other opportunities or options that can keep you more active in your day-to-day living. For example walk up the stairs instead of using elevators, park your car farther out in the parking lot, walk your dog two times in a day & play enthusiastically with your grandchildren. Such small lifestyle changes all together will enable you increase the number of calories you burn, helping you creating significant calorie deficit – which you need to lose weight and reduce belly fat.